A Georgian style hotel,with decorations and furnishings hand-selected and imported by the owners themselves from Europe,a cozy fireplace await your stay. And also our Concierges, who will act as your butler, catering to your every need. All eight rooms are complete with a full bath. 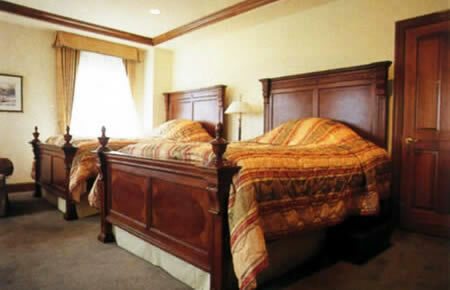 Three "Superior" twin rooms (Queen-size beds); one Double rooms (King-size bed); four Standard twin rooms (Queen-size beds). In addition to the restaurant, we have a spacious lounge, English-style bar,150-inch screen video theater, and extensive wine cellar, carefully selected and waiting to be enjoyed. 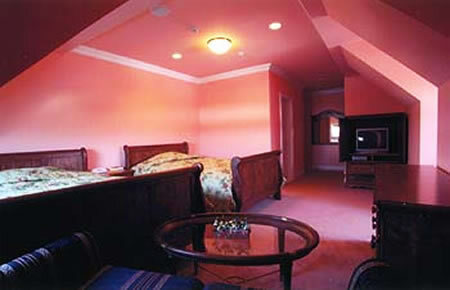 Everything is arranged for your comfort and to make your stay as comfortable and relaxing as possible. Room charge includes breakfast Consumption Tax included.